Hine's interest in social welfare and in reform movements led him in 1905 to begin his first documentary series; immigrants on Ellis Island. In 1908 he left teaching to become an investigator and photographer for the National Child Labor Committee (NCLC), and between 1908 and 1916 he traveled extensively photographing child-labor abuses. Hine would manage to gain access to the sweatshops and factories where children were employed, and then, if he could, photograph them at work. Hine inveigled his way into factories by posing as an insurance agent, bible salesman, postcard seller, or industrial photographer. Once inside, Hine quickly would go about his business of photographing the children working. 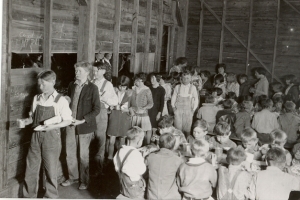 Having been a teacher, Hine was comfortable talking with children and would attempt to get as much information as possible regarding their living conditions, the circumstances under which they were forced to work, and their name and age. If he was unable to determine a child’s age by speaking to him, Hine would surreptitiously measure the child’s height against the buttons on his vest and estimate the child’s age by his height. If Hine was not able to gain admittance to a factory, he would wait outside the gates and photograph the children as the came to work. He visited children and families who worked at home and he wrote with impassioned sarcasm of the "opportunities for the child and family to enlist in the service of Industry." The Cantor Arts Center at Stanford University is pleased to announce Soulmaker: The Times of Lewis Hine, a new exhibition that explores the artistic mastery of photographer Lewis Hine’s images of children working in mills and factories in the early 20th century.